Purchasing a mattress is a big decision, one that should never be rushed. The last thing you want to do is invest in a bed that’s going to make you uncomfortable. At John Ryan By Design we sell double mattresses of the highest standard. This is tied into the material and build quality. We’ve built our reputation on the expertise we have within the mattress industry. As far as we’re concerned, the bed retailing industry is based on personal service. It’s why we’ll take you through every aspect of the buying process, from answering questions on mattress size, to the material that has been used to craft it. Details are important. Our collection of double mattresses is extensive, ranging from Natural Fibre pocket sprung to Man Made pocket sprung. Both types of mattress are some of the most comfortable options on the market. Choosing the right double mattress comes down to size and weight. After all, you wouldn’t want to buy a mattress that doesn’t provide enough room to stretch out on. What are the dimensions of a double mattress? When you have an idea of the dimensions, it will make buying a double mattress much easier. What types of double mattresses do we offer? Our range of double mattresses are built with comfort and value in mind. A great example of the quality of our mattresses is the Origins Pocket 1500, a pocket sprung product with a three year guarantee. The 1500 is a good choice for anyone who is looking for an affordable mattress. For anyone who fancies an upscale double mattress, then the Artisan Naturals could be what you’re looking for. Made with 85% Natural Fibres, the Artisan Naturals features a Vanadium coating for extra support. The 10 year guarantee ensures you’ll have a mattress that lasts. 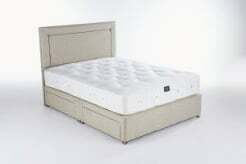 What makes a John Ryan mattress worth buying? Our double mattresses are a combination of practicality and comfort. We’re up front about everything, from the price of a product, to whether we feel the mattress would suit you. An important part of our business is the 60 day ‘Love It or Return it’ guarantee. The guarantee works on the understanding that if you aren’t happy with the product then we’ll arrange to have it collected and refund you in full. We value your satisfaction above everything else. For more information on buying a double mattress then get in touch with us on 0161 437 4419. We also encourage you to submit any questions to us online.